This Application works perfectly Offline. No need of wifi/mobile data Connection. 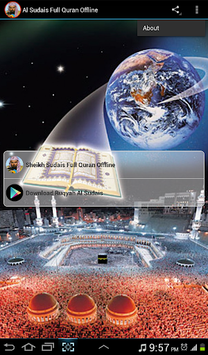 Just download and start listening to any Surah right away. Once you download it, then at anytime you can listen to the Complete Hloy Quran - Abdelrahman Sodes at anytime without data or wifi and don't worry the Audio Quality is also great for reasonable listening. This Application is unique because it is not as huge as the others, it is less than 80MB! No need of Internet Connection! App is Incredibly small in size and Audio quality is Great! Repeat track as many times as you want. 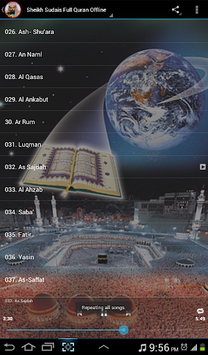 Quick access to the Quran files from your system tray/notification bar. AbdurRahman Ibn Abdul Aziz as-Sudais (Arabic: عبد الرحمن السديس‎ (ʻAbd ar-Rahman ibn ʻAbd al-Aziz as-Sudais Hanbali), born 1960 in Riyadh, Saudi Arabia) is the imam of the Grand mosque in Mecca, Saudi Arabia, a renowned qāriʾ (reciter of the Qur'an),and was the Dubai International Holy Qur'an Award’s "Islamic Personality Of the Year" in 2005. He comes from the Anza clan, and he had memorized the Quran by the age of 12.Growing up in Riyadh, he studied at the Al Muthana Bin Harith Elementary School, and afterwards the Riyadh Scientific Institution from which he graduated in 1979 with a grade of excellent. He obtained a degree in Sharia from Riyadh University in 1983, his Master's in Islamic fundamentals from the Sharia College of Imam Muhammad bin Saud Islamic University in 1987 and received his Ph.D. in Islamic Sharia from Umm al-Qura University in 1995 while working there as an assistant professor after serving at Riyadh University. He took up his imamate in 1984, at just 22-years of age, and conducted his first sermon at the Grand Mosque in Mecca in July 1984, other than this Sheikh Saud Al-Shuraim - has been his partner in Taraweeh Prayers from 1991 till 2006, and again in 2014. In 2005, he was named by the Dubai International Holy Quran Award (DIHQA) Organising Committee as its 9th annual "Islamic Personality Of the Year" in recognition of his devotion to the Quran and Islam. When accepting his award in Dubai, he said: "The message of Islam and Muslims is modesty, fairness, security, stability, sympathy, harmony and kindness." From 2010 to 2012 he visited India, Pakistan, Malaysia and Britain. Among his activities has been hosting a seminar at the Higher Institute for Advanced Islamic Studies in Malaysia in 2011, where he spoke about Islamic civilization against the backdrop of modern challenges. Abdul Rahman Al-Sudais was appointed head of the "Presidency for the Two Holy Mosques at the rank of minister" by royal decree on 8 May 2012. Reference (Wikipedia). For more Islamic mp3 Apps check my catalog. Thank you very much for checking out this App.